Moorish idol fish are beautiful, ornate, and stunners in an aquarium. They are a rarity, too. Not in the oceans, but in aquariums. Most die very easily in captivity. Most do not make it a week after you make the purchase. The primary reason is they are such picky eaters, they would rather starve to death than eat something they do not want. In Hawaii it is called Kihikihi which means "curves," "corners," or "zigzags," and refers to its shape and color pattern. It is commonly mistaken for an angelfish, butterflyfish, pennant, or bannerfish. The Moorish idol can be found throughout the Red Sea, the Indo-Pacific and eastern Pacific oceans. It has been reported in the western Pacific from Kominato, Japan, down to Lord Howe Island, New Zealand, and in the eastern Pacific from the southern Gulf of California down to Peru. 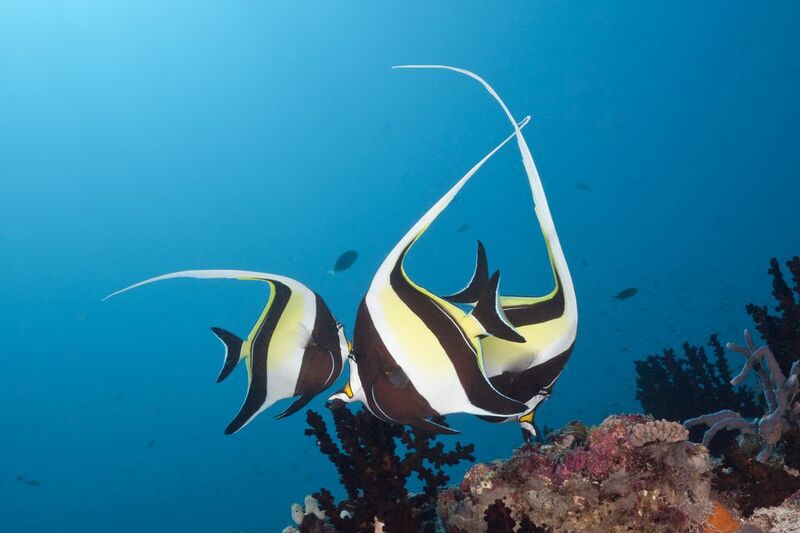 It is called the Moorish idol as a reference to the Moors of North Africa, who are said to believe that the fish can bring happiness to those who dwell near it. It is the only member of the family Zanclidae, and a very close relative of the tangs or surgeonfish. These fish have disk-like bodies and are often mistaken for butterflyfish, which are also disk-like and have similar coloration. Moorish idols have starkly contrasting bands of black, white, and yellow. Moorish idols have small mouths at the end of long, tubular snouts; many long bristle-like teeth line the mouth. The fish have relatively small fins, except for the dorsal fin, which has spines that form a trailing, sickle-shaped crest. It's scientific name, Zanclus cornutus, is a reference to its distinctive trailing crest. Zanclus comes from the Greek meaning to "bow on the back," especially like a scythe; Greek cornutus means "horned." Hence, the derivative "horned scythe." If you are going to buy a Moorish idol, make sure that the color markings are dark and bright, not faded or washed out. If the fins and the tail appear to be frayed or ragged looking or are partially burnt off around the edges, and the fish's eyes are cloudy, this is most often a sign of exposure to ammonia burns, which usually stems from bad collecting and shipping practices, but can also result from poor aquarium water quality and care. if the sickle-shaped streamer is missing, but you can see a new, small white filamentous-like growth starting to grow out of where the streamer used to be, it's an excellent sign that the fish is getting the proper care, recovering and regaining a state of good health. Now if the streamer is missing, but no new growth is yet apparent, it's a good idea to wait a week or two to see how the fish's condition progresses. The fish's body should appear somewhat full and rounded out at the sides, the stomach area should not appear concave or sunken, and the skeletal structure of the fish should not be noticeable underneath the skin. Typically the Moorish Idol is a moderately-peaceful fish best kept with other non-aggressive species. Potential choices for tankmates include chromis, carnivorous grazers such as wrasses, and cave-dwellers such as more peaceful dottybacks. In regards to keeping multiple numbers of these fish together, there are many opinions. Some hobbyists recommend only keeping this fish singly or in mated pairs, while others suggest they only do well if introduced into an aquarium in groups of four, six, ten, or whatever. From experience, we know that large mature adults have a low tolerance for one other, and therefore keeping a single specimen or a mated pair is recommended. As far as juveniles, although this fish does seem to commune fairly well as a group, nonetheless their behavior towards one another can be unpredictable. Sometimes a group of smaller Moorish Idols will get along just fine, while other times there may be one renegade in the group that becomes dominant, and decides to pick on all the others. Moorish idols should be provided with plenty of unobstructed swimming space, as well as ample reef-like hiding places to take refuge when feeling threatened. A tank of 150 gallons is recommended, although you can try a 100-gallon tank. Moorish Idols will often pick at large polyped stony corals, and certain soft coral polyps. Although this fish primarily eats coralline algae and sponge in nature, this doesn't mean that it might not pick at other types of sessile invertebrates, or maybe even motile crustaceans. Typically difficult fish to keep, larger specimens usually do not adjust well to aquarium life. With the tendency to ignore foods offered, most often their health will decline due to slow starvation. Smaller juvenile or sub-adult specimens may more readily adapt to their surroundings, but just the same, these fish are unpredictable in their feeding behavior. Before you buy one, make sure the one you buy is a proven eater. If you buy from an aquarium shop tell them a proven eater is a condition of the sale. If the fish has already been fed, ask when the next feeding is and return to witness it on your own. Then, match the food the shop is using—exactly. Use the same feeding schedule. For fish that refuse to eat, to survive in captivity, you may need live rock that is rich with coralline algae and sponge growth to stimulate the fish's desire to eat. Offer finely chopped fresh or frozen shrimp, clams, squid, and other meaty fares suitable for carnivores, live mysid, and brine shrimp, some vegetable matter as well as supplemental vitamin-enriched prepared foods that contain marine algae and spirulina. Feed two to three times a day. This species does not seem to have any unique identifying characteristics between the sexes. The Moorish idol, like its surgeonfish cousins, are pelagic, meaning it's a free-spawner or egg-scatterer that spawns in groups. The female ejects her small eggs in the water column after which the male swims over and through the egg cloud fertilizing as he goes. The female produces hundreds of eggs at a time a number of times per year, usually in the spring and summer months.